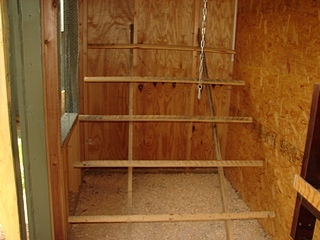 Chicken perches provide a place for your chickens to roost. They may spend some time on the perches in the day, but should all be there at night. Providing a safe night time perching or roosting area will ensure that your chickens will want to come home to roost each night. It also provides a nice place for chicken manure to collect below. Chickens like to go to sleep with a nice full crop, so are digesting and passing droppings all night. Some people put a collection tray under the perch for easy cleaning. Make sure you allow at least 8 to 10 inches of space along the perch for each chicken. The more The better. Chicken perches should start about 18 inches off the ground. I made my perch using a ladder type style. I cut two runners using 2x2's 85 inches long. Then I Cut five 1x2 boards 45 inches in length. I rounded them off using a planner and sander. Since I have exposed 2x4's(studs wall) in my chicken coop I mounted the runners at a 35 to 40 degree angle using a 4 inch bolt. One on each stud 16inches apart. I then screwed my first perch to the runners 18 inches from the floor. I then measured 12 inches from the first perch and screwed in the next one until all 5 perches were finished. 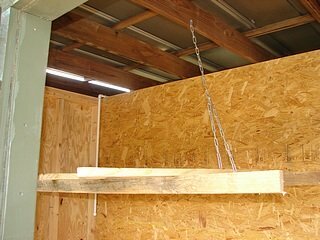 As you can see I fastened a chain to the ceiling joist so that I can raise my perch and fasten it off. This makes cleaning under the perch fast and easy. 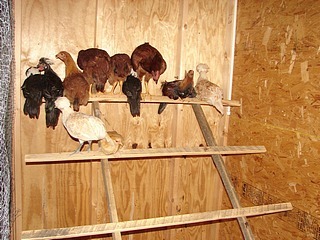 Chicken Perches can be made from 2x2's, broom handles, dowel rods and natural tree limbs. Try to keep the diameter at about 2 inches for larger chickens and 1 inch for bantam size chickens. Round off any sharp edges and sand rough spots. Some people in colder climates will use 2x4's mounted with the wide side up. This keeps the chickens feet flat on the board and this is suppose to help keep there feet warmer. Chicken Perches are an important part of the chicken coop. Just don't get overwhelmed by thinking it has to be a certain way. There are many ways to approach this, just use your imagination, you can do what you like as long as chickens can reach the roost, aren’t pooping on each other all night, and there’s plenty of room for everyone. Keeping the chicken coop closed up at night is important. Once a predator has been in there and scared or harmed chickens, the chickens will want to roost somewhere else. Chicken perches provide sense of security at night. The best material is wood. This is a chicken’s natural roost or perch beginning thousands of years ago. Before chickens were domesticated they roosted in trees. This kept them safe from the most common predators at night. Chicken vision is extremely poor at night leaving them blind and unable to flee from an attacker. They can’t see the attacker, so they can’t see exactly which way to go to get away. During the day chickens have excellent vision enabling them to monitor birds of prey in the sky or see the tiniest seed, mite or bug as they forage and often can manage enough flight to escape the mouth and claws of a predator. A smooth flat or rounded top side of Chicken perches seems to give them the most comfort at night. They sleep just about as long as we do and are pretty much stuck in one place with feet in the same position all night. Offering a variety of perch sizes and types will allow your chickens to choose their favorite. I have heavy laying breeds and heavy roosters, so I use good old 2 x 4s. If I have a long area to span, I may use a 4 x 4. I believe the flat surface offers a more relaxed footing, though natural branches seem to make chickens happy, too. By the way, have you yet to build your chicken coop? 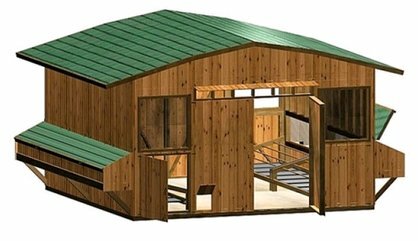 Confused about where the find the best coop design plans? I get it! So I took the time to preview a couple coop plan resources. If you need quality plans then take a look and I'll simplify the process.